Even though he willingly decided to take part in the National Youth Service Corps scheme earlier this year, Davido ended up breaking some of the scheme's bye-laws. 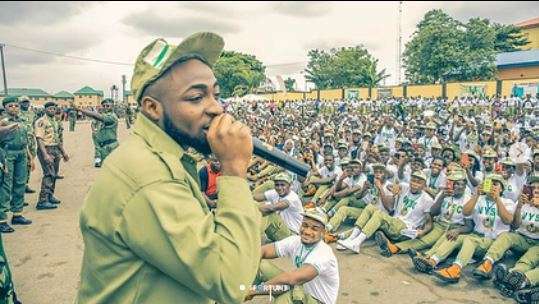 A Punch Metro report has shown that the National Youth Service Corps says it has communicated with popular musician, David Adeleke aka Davido, over his activities during his service year. Davido’s enrolment for the NYSC had created a stir, as he became the cynosure of all eyes at the Iyana Ipaja, Lagos orientation camp where he had submitted himself for registration in August 2018. He had also posted pictures of himself in the NYSC kit on Instagram, as other corps members in Batch ‘B’ Stream 2 swarmed him at the camp. Just afterwards, Davido left the camp and began a series of violation of the rules of the service. Other NYSC by-laws violated by Davido include: bringing vehicles into the orientation camp; disclosing official information; engaging in private practice; taking part in partisan politics; reporting late to duty among others. He thereby violated the first law of the NYSC, which said all corps members must participate in all activities in the camp. It cannot be ascertained if he did not violate the second law, which stated that corps members leaving the orientation camp should get the written permission of the state coordinator. But the Assurance crooner did not stop at Boston, as he continued globe-trotting, visiting Philadelphia, New York, Washington DC, Georgia, Minnesota, London, Sao Tome, Accra, Mayotte, Lebanon, UAE, among others. Davido within the period was also actively involved in the electioneering of his uncle, Demola Adeleke, a gubernatorial candidate of the Peoples Democratic Party in Osun State. But the NYSC law not only prohibited participation in partisan politics but said corps members should not leave their place of primary assignments without the permission of their state coordinators. “Any member who takes part in partisan politics is liable to extension of service for a period not less than three months without pay,” Section 9 under the Miscellaneous Offences and Penalties, read. But the artiste, while replying to a post on Instagram, said his NYSC programme had been terminated. He later deleted the comment from the post made by a friend.